A procedure to treat Dupuytren’s Contracture. A condition in which tissue in the palm of the hand, covering the finger tendons, thickens and scars. Dr Andrew Monk is the leading physician in Melbourne to treat dupuytrens contractures by percutaneous needle fasiotomy, a treatment for dupuytrens that was popularised by French physician Dr J L Lermusiaux in Paris 20 years ago. Dr Monk has been successfully using percutaneous needle fasciotomy to treat dupuytrens for the past 12 years. Dupuytren’s Contracture is a condition in which tissue in the palm of the hand, covering the finger tendons, thickens and scars. The affected tissue, called the palmar fascia, becomes tight and shortened, contracting the fingers inwards toward the palm. It can affect any of the fingers, but it most commonly affects the little finger and ring finger. It can occur in only one hand or in both hands at the same time. Dupuytren’s is a relatively common condition but the cause is not fully understood. In most cases it does not occur until after the age of 40 years and it is more common in men than it is in women. It runs in families, and is more common in people of Western European descent, so it is thought that genetics can play a part. The condition is not painful in itself but can cause aching and itchiness. As the condition progresses, there may be dimpling and puckering of the skin over the area and it becomes difficult to fully straighten the fingers and hold objects. 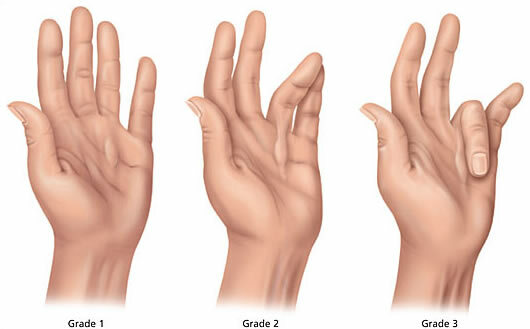 Eventually contracture of the fingers may become so severe that they cannot be used and the finger joints become fixed. Percutaneous Needle Fasciotomy is a minimally invasive procedure and DOES NOT involve an incision or sutures. Patients have a fast recovery with no loss of function and there are few complications. Local anesthetic is injected into palm of hand at the site of the Dupuytren bands. This serves two purposes, to numb the hand and to separate the band from surrounding tissue. A fine needle is then used to repeatedly puncture the band so it weakens and breaks. Each band is broken in 2 places. The length of the procedure depends on the number of bands to be broken. Following the procedure there may be a small amount of bleeding from the puncture sites. Antibiotic ointment is applied; a pressure dressing of gauze and a crepe bandage is used to stop any bleeding. Antibiotics maybe prescribed for 4 days post procedure to ensure that common bacteria found on the hand do not infect the puncture sites. Most patients are able to drive immediately following the procedure. The dressing can be removed the next day and the puncture wounds can be covered with band-aids. It is very important that you DO NOT use the affected hand to lift any heavy objects for 7 days following the procedure. Regular hand exercise post procedure is important in obtaining the best result. To further stretch the bands, patients are encouraged to place the open palm of the affected hand on a hard surface and press down on the back of the hand with your other hand to straighten out the fingers. Do this exercise several times during the day. Some patients may experience tingling in their fingers for up to 2 weeks post procedure; this occurs if the band is situated close to a nerve. Percutaneous needle fasciotomy may need to be repeated to obtain the best results. A follow up appointment is recommended 3 months post procedure, with further appointments as required thereafter to maintain and sustain the best outcomes possible. Sclerotherapy is a medical procedure used to eliminate spider veins on the legs. An iron infusion is given to patients who have low levels of iron in their body.